My teenage daughters had a wonderful time riding around Rome seeing all the sites. The only problem for me was navigating through crowded cobbled streets. Otherwise its a great way to see the city. Our guide, Rik, was awesome. The lunch was incredible and would definitely recommend this to anyone. I give this only three stars based on my personal experience, but others in our group would, I am certain, post a full five As an older woman, somewhat out of shape,.....what was I thinking?! It never occurred to me to have the seat lowered so my feet could touch the pavement when we stopped, Instead it was necessary to jump off which resulted in losing my balance and falling more than once. The guides, however, were very patient, concerned , informative, and helpful. We covered more of the city than we otherwise would have and enjoyed a lovely lunch. In the future, I shall leave this adventure to younger travelers. What a way to experience the backstreets and outlying sites . Zipping from piazza to piazza with our knowledgeable guide making regular stops to explain what we were seeing was exhilirating. Lunch was very good and the Gelato stop was a real surprise: i dont normally do ice-cream but the extensive range of flavours extended to the fascinating. This is a must do. SO AMAZING!!! Highly highly recommend, Imke was absolutely incredible. We had signed up for a group tour but ended up only being the two of us so it was a private group with our amazing guide. We got to spend as much time as we wanted at the sites that interested us and had a fun girls day riding around Rome : Lunch was phenomenal and we ended up going there again at the end of our trip! The best day or our Europe trip. 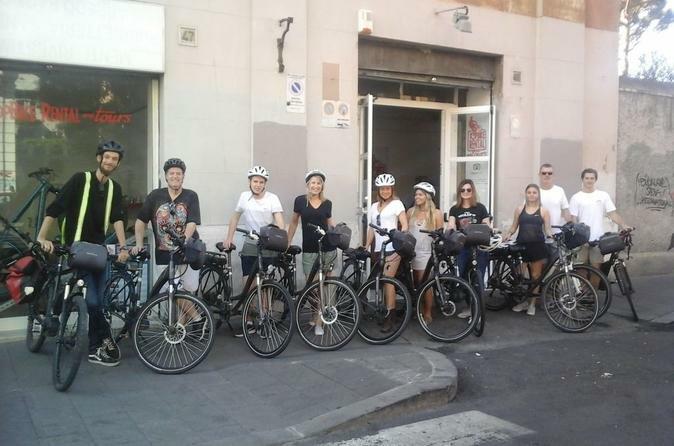 The only way to see really see Rome is on a bike, and this tour let us see just about everything. Bruno our guide had a Masters in History, and his knowledge and insight really brought Ancient Rome alive for us.This tour was so complete, we cancelled our Hop-on-Hop-off bus tour the next day, as we had already visited every stop! Instead, we went back and rented bikes on our own so we could revisit our favorite places. Can not recommend highly enough...you must do this! A great way to see the City and get a feel for all those things weve half read and half understood. Bruno our guide was a really good host. The electric bikes are very good. It was truly an amazing day. A fantastic way to see the city. We got to see parts that we would never have seen unless we lived in Rome. Emanuele our guide was informative, erudite, funny and really added to the tour by giving his own personal views to what we were seeing and the Italian condition. Lunch was fantastic, the ice cream was amazing and we had the best coffee I have ever tasted. If you have a spare day in Rome, I highly recommend doing this, it's brilliant. 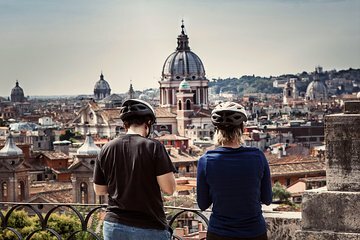 We did a 6 hour bike tour of all the major sites in Rome. A fun experience to see it all in one day. The tour guide and the rental bike company were excellent. We stopped at a quaint restaurant for lunch. The electric bike was easy to operate. A most excellent way to see it all in just one day. Obviously, not much time at any of the sites but if you have only a day and want adventuresome on bike through the crowds and traffic!!! way to spend the day, this is it. Excellent bike, equipped with electric assist. Excellent guide, knowledgeable of history, various buildings and the key personalities. Lunch was just ok as restaurant didn't seem to care we were there, food just ok. Outstanding gelato stop, too! My fiance and I went on this electric bike tour and lived it! We saw so much, ate a fantastic lunch, learned about the history of Rome. Ended a perfect day with gelato in a quaint place. I would highly recommend this tour.